Snap beautiful photos of Waikiki on this 90-minute sail, where you'll cruise past famous Waikiki Beach and out towards Diamond Head crater. The cruise departs from Kewalo Basin by Ala Moana Beach Park, and includes snacks, non-alcoholic drinks, and two drinks from the bar. Keep an eye out for Hawaiian Green sea turtles that pop up and surface for air, and transport is included from select hotels in the local Waikiki area. 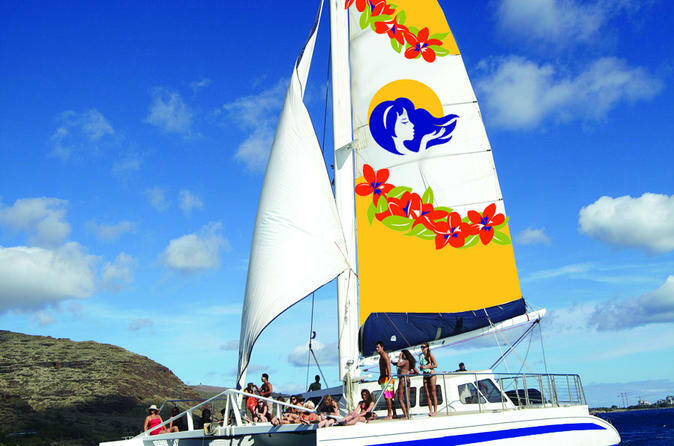 This sail begins at Kewalo Basin in the Kewalo-Kakaako district, and departs the harbor at 3pm for a 90-minute cruise. Depending on where you're staying in town, shuttle service is included from many Waikiki hotels, and pickup is usually 30-60 minutes before the cruise. Once you've found a spot on the deck and the crew has cast off the lines, you'll cruise the waters off Waikiki for a sweeping view of the coast. See how the rugged Ko'olau Mountains rise up from behind the skyline, and keep an eye out for honu, or turtles, that occasionally surface for air. In winter months from December-April, Humpback whales are often seen splashing, spouting, and breaching offshore, and even Hawaiian Spinner dolphins are known to make an appearance. You'll cruise past famous Waikiki Beach and out toward Diamond Head crater, all while enjoying the free snacks and two drinks included from the bar. After 90 minutes of plying the waters just off the Waikiki coast, the cruise finishes back in Kewalo at around 4:30pm.